For the family of Pastor and Mrs. Kevin Gabriel, this is not the best of time as the peace they use to know has fled, turning their happiness into a mixture of panic and palpable terror. This is because their daughter, Miss Peace Gabriel, 20, has gone missing for about three weeks now. Narrating their ordeal, Pastor Kevin said his daughter left their residence in Abuja on the 3rd of January, 2016 for Nasarawa State University, Keffi, where is undergoing a Diploma programme in Mass Communication but has since then remained incommunicado. According to the cleric, who came in company of his wife, their daughter had refused to answer all calls placed to her phone since she left home which necessitated the mother to visit the university two weeks ago to know her way about but no news was heard of her. The pastor said when the wife came to make the inquiry, she was bewildered to learn that her daughter hasn't returned to campus since she left Abuja. Some of her course mates, according to the mother said Peace has not been in school since November 2015. The matter was made worse when no one among the students, even her closest friends, could say where the missing girl resides. Investigation revealed that Peace Gabriel likes to keep to her self and constantly refused taking her friends to her residence, which they claim is somewhere in GRA, Keffi, though she has never taken any of them to her apartment. Our reporter also found that Peace has not registered for the present semester, confirming that she may not have been on campus for a long time despite that the parents said she has been given everything she needed for her registration, including fees. Mr. Anthony Ogande, Coordinator of Mass Communication Diploma programme, said the missing girl is an elusive type that hardly take her classes serious. He confirmed from the register that Peace Kevin, though a Diploma student of Mass Communication, has not registered for the present semester. No one can confirm what led to the disappearance of the young lady. The parents refuted that there was an altercation or quarrel between them which may have triggered her decision to remain incommunicado since she left home that fateful day. They said she left them in best of mood and there was no misunderstanding between them. The parents also said no one has contacted them demanding for any ransom, thereby making it unlikely to be a kidnapping case. At present, the only possibility according to some respondents is that she may have eloped with a man and possibly having the fun of her life somewhere she would not want anyone to locate them. They say that cases like this abound and she will resurface as soon as she is done "catching fun with her lover". The truth cannot be confirmed in this claim. 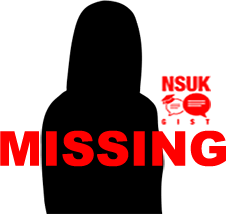 The Deputy Registrar and Head of Information and Protocol Unit NSUK, Alhaji Jamil Zakari has promised the parents that the university will do its best to find their missing daughter. He directed them to make a formal notification to the security unit. Alhaji Zakari wants anyone with useful information about the missing girl to contact NSUK management or nearest police station. Meanwhile, events in the last few days in NSUK have been one of terrifying episodes of unpalatable news. Just yesterday, a 300 level male student of NSUK was arrested for kidnapping a teenager. We are also still tracking a story of a girl reportedly killed yesterday in Angwan Lambu in the cause of an alleged cult initiation. We therefore warn all students to be conscious of their environment and report all suspicious movements to the school authority or to Security agents.